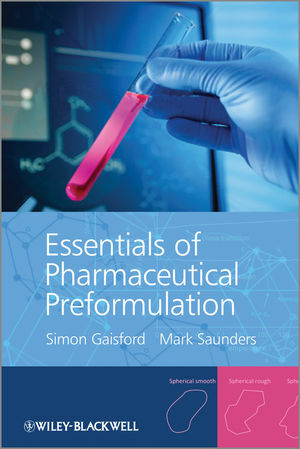 Essentials of Pharmaceutical Preformulation is a study guide which describes the basic principles of pharmaceutical physicochemical characterisation. Successful preformulation requires knowledge of fundamental molecular concepts (solubility, ionisation, partitioning, hygroscopicity and stability) and macroscopic properties (physical form, such as the crystalline and amorphous states, hydrates, solvates and co-crystals and powder properties), familiarity with the techniques used to measure them and appreciation of their effect on product performance, recognising that often there is a position of compromise to be reached between product stability and bioavailability. Undergraduate-level pharmacy students and R&D / analytical scientists working in the pharmaceutical sector (with or without a pharmaceutical background) will find this text easy to follow with relevant pharmaceutical examples. Mark Saunders was awarded his first degree in Biological and Medicinal Chemistry from the University of Exeter and his PhD from the London School of Pharmacy under the supervision of Professors Kevin Taylor and Duncan Craig. His PhD programme was sponsored by GlaxoSmithKline and involved the design and characterisation of novel injectable lipid-based carrier vehicles for the treatment of Cystic Fibrosis. After finishing his PhD, Mark consulted for the London based legal firm SJ Berwin, providing independant laboratory services in support of a successful major patent litigation trial on Paxil (Paroxetine Hydrochloride). After this, Mark was appointed Physical Scientist at a London based Contract Research Organisation (CRO), where he oversaw the growth and development of the company through to a commercial sell in 2007. After spending 5 years in the Research and Development support arm of the company and having set up both the Physical Properties and Screening laboratories, Mark moved into Strategic Development where he directly lead the successful set up of a Japanese Business Development office in Tokyo. After 2 years in this position and havng seen the company grow significantly, Mark moved from this role and was involved in the commercial set up of Kuecept Ltd, of which he is a co-founder. Mark is also a member of UK and US Controlled Release Societies, Royal Society of Chemistry, Association of Pharmaceutical Scientists (APS), Internation Society of Aerosol Medicines, sits on the committee of the APS Materials Science Focus Group and has co-authored over 20 peer reviewed papers and 2 book chapters on preformulation.